Oracle Think Tank is one of the more intensive clans to play, requiring a great deal of forethought and planning to control the overall direction of a fight. Their strategy can be summarized as predicting the future; both the immediate future just moments away, and the distant future up to several hours in advance. 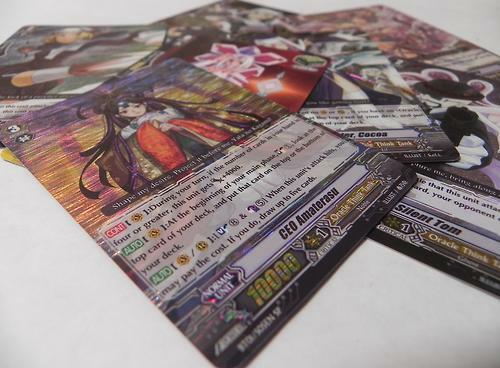 As one of the oldest clans in Cardfight, Oracle came out of the box with its prediction strategy enduring to this day. Like all Descent of the Knight King-era first vanguards, Lozenge Magus (and her reprint, Sphere Magus) is designed to leave the field. When ridden over, she moves to any rearguard circle of her fighter's choosing. And when boosting, Lozenge adds an additional +3000 to the attack, making her a solid +6000 power booster that can either form a 13000-power line with most grade 1 vanguards that will make the attack difficult to justify guarding, or set the second turn up for forming a 16000-power line with Wiseman. Cards like these are a form of hand conservation. Lozenge comes from "nowhere," taking nothing away from your hand and instead giving you a free unit. When compared to the likes of Stardust Trumpeter, Undeux and Kaleido Ace, you will generally call one less unit because you are gaining one automatically, removing the pressure from your hand. The flip side of this is that after boosting, Lozenge then returns to the deck in the end phase, and while this resets her user's card advantage back to 0, it's par for the course of a set 1 FVG. Another option is to move Lozenge to a forward-facing rearguard circle and then call Gemini as a booster for her. This unusual method can produce an 11000 column that is occasionally sufficient for the first turn, but opens Lozenge up to being retired, and requires briefly flipping the column around to cycle her into the deck and open a circle up for Gemini to boost something more powerful once the game proper gets underway. That maneuver will likewise open Gemini up to attack, and still ultimately leaves Lozenge's fighter at a disadvantage while possibly deepening the disadvantage by ending with Gemini retired. Thus, Lozenge is usually best used as a booster on the first turn. With the upcoming set 7 "Rampage of the Beast King," OraThin gets a new first vanguard for their old style of play. Like Lozenge, Battle Sister, Eclair moves to the rearguard when ridden over, and while her 4000 power won't be bringing any rearguards to speed, it can work with some vanguard OraThin skills that give power bonuses. More importantly, Eclair's skill is to counterblast 1 in the main phase, then soulcharge herself and look at the top five cards of the deck for a grade 3 Oracle Think Tank and add that unit to hand. While the random nature of this skill is a key weakness to Eclair, the resulting lack of advantage is essentially the same as using Lozenge while providing the opportunity to gain a one-card boost, and OraThin is a heavily soul reliant clan that benefits from having more cards in the soul. Even if Eclair doesn't grab a grade 3 for you, her presence in the soul can combo with some other cards described below like Luck Bird, or otherwise fuel vanguard soul-based skills. Most of these types of units don't have an argument for them because their skill is most useful later in the game when retire-based units like Gwynn, Saishin, Tejas, Blaster Blade and Berserk Dragon have hit the field, but in Eclair's case using her on the very first turn can be an enormous benefit to OraThin's play style. While there's no particular grade 3 that Lozenge or Eclair are intended to work with, the units introduced in OraThin's debut set are CEO Amaterasu and Oracle Guardian, Apollon. Amaterasu will be the focus here, as Apollon is intended for the rearguard circle. Like her contemporary Vortex Dragon and Lohengrin, Amaterasu is a megablast unit that can counterblast 5 and soulblast 8 with a particular timing to achieve a clan-related effect. In her case, this skill is active in both the vanguard and rearguard circles, and she can activate it when her attack hits to draw five cards. This is fueled by her autoskill, soulcharging 1 at the start of the main phase; unlike the aforementioned units and more in the vein of Mr. Invincible, this skill is clan-related. While most megablast units gain +2000 power from their soulcharge, Amaterasu instead looks at the top card of the deck and choose to place it on the top or bottom. This is where Oracle Think Tank's short-term prediction abilities come in, because this lets you immediately know whether top card of the deck is a trigger or not, and if it isn't you can then place it on the bottom, or otherwise leave a good card on top to wage psychological warfare with the opponent while adding a good card to your hand. The booster that ties in best to Amaterasu is Weather Girl, Milk. Milk's skill is simple--at the time that she boosts an Oracle Think Tank vanguard, if you have four or more cards in hand, the unit that she boosts will then gain a total +10000 bonus, bringing Amaterasu up to speed with 9000- and 10000-power vanguards. This also ties to Amaterasu's continuous skill, which gives her +4000 power when you have 4 or more cards in hand, for a 24000 total. However, while Amaterasu's skill will kick in even if you drive check your third and fourth cards, Milk's skill requires that you have four cards in hand when you boost with her. So if you only have two cards in hand and then use these two together, the sum power will only be 20000, not 24000, which gets in the way of fighting 11000-power vanguards. If you know ahead of time that you'll only have two or three cards in hand during the boost, Gemini makes a better call than Milk does. With Gemini's 8000-power boost, Amaterasu can then reach 22000, just enough to get the same effect as Milk versus all but crossride units. The reason that 22000-24000 is such an important number is that experienced players usually guard your attacks to account for at least one trigger. When your attack power is just 20000, most vanguards will need one 10000 shield card and one 5000 shield card to defend with, but when it's at 22-24000, they'll need two 10000 shield cards. And at three or more damage, most people guard for two triggers, being wary of the maligned double-critical. So that's three 10000-shield cards and one 5000, taking four cards right out of their hand and leaving them open to pressure from your rearguards. And speaking of rearguards, OraThin has one of the strongest grade 2 units in the existing game. Silent Tom only has 8000 power, and so will most certainly need Gemini to oppose higher-power vanguards, but his skill prevents him from being guarded with a grade 0 unit as long as you have an Oracle Think Tank vanguard. No grade 1 unit has a shield of 10000--only through specific, counterblast-based skills can a grade 1 unit achieve that amount of shield. So Silent Tom with Gemini automatically demands two cards to defend against, and if you apply one trigger to him, he now demands three. Amaterasu, Milk, Tom and Gemini applied together correctly can drain as many as six cards on a well set-up turn, barring a perfect defense coming into play. Stressing the emphasis on prediction are the duo of Circle Magus and Battle Sister, Cocoa. Like Amaterasu, Magus allows you to examine the top card of the deck, this time when she's ridden or called. However, Circle requires you to leave the card on the top. Cocoa has just 6000 power, 1000 less than Magus, but lets you choose whether it goes on the top or bottom. These two, when used in a proper sequence with Amaterasu, can help you ensure that the top card of your deck is a trigger, or otherwise build a stack of cards on the bottom of your deck that you can eventually drive check into by using these units with OTT's draw skills to shave off the cards between you and your stack. In addition to Silent Tom and the standard Wiseman, another recommendable grade 2 for OraThin is Battle Sister, Mocha. While like Tom, she has just 8000 power, when she attacks and you have four or more cards in hand, her power increases by +3000; this isn't enough to break the 20000 line even with a powerful booster, but it can let her get by with Luck Bird or Eclair as a boosting unit, and she's very likely to hit that number since you should be trying to have four cards in hand in the first place for Amaterasu and Milk. Oracle Guardian, Apollon and Maiden of Libra bring a different variety of pressure. Most cardfighters prefer to either block a weaker rearguard and then take a full attack from the vanguard, or put everything into stopping the vanguard while taking both rearguard attacks. Apollon and Libra work differently--both of them counterblast 2 to draw a card when their attack hits. In the vanguard circle, Apollon pays the same cost to draw 2 and then return a card from the hand to the deck. Apollon's vanguard skill is actually less desirable because he then forces you to shuffle the deck, ruining your growing stack of cards, but in the rearguard these two units force the opponent to guard in order to stop you from gaining hand advantage. They can also combo versus 9-10000 power units (11000 for Apollon) with Moonsault Swallow, a 6000-power grade 1 that returns to hand when the attack of the unit that it boosts hits. If the attack is spent on a rearguard, you present to your opponent a scenario in which they would lose one card while you add two to your hand, giving you a potential minimum of 10000 and a maximum of 15000 extra shield to stop their attacks with. This forces the opponent to go from guarding just one or two units in the turn to all three, and as mentioned with Amaterasu and Silent Tom, they're already going to be down six cards by the end of that turn. In Apollon and Libra's case, that's an additional 10000 shield that they may just not have to spare, occasionally forcing them to accept you gaining a large lead in hand over them. When I revisit this clan next, I'll be discussing their six-soul play style and the Goddess of the Full Moon, Tsukuyomi.